On Saturday, I drove the familiar route to Logan airport. I go there all the time. I pick up visitors. I travel for work, or for fun. It’s a rare month that I don’t mentally try to figure out whether I want arrivals or departures. (Well, I’m arriving at the airport, but departing later, and oh I’m parking and is it Terminal B?) This time, though, I had Thane with me. And only one suitcase. We did all the line-standing together, and all too soon he was heading down the gangway with a veritable pack of unaccompanied minors. I sat in the warm sun with a collection of other parents sending their kids to Seattle for the April vacation week, talking about parenting, the difference between Seattle & Boston, and the independence of our children. Adam came home not long after, and we cleaned the house, marveling that it might actually _stay clean_ for a WHOLE WEEK! The kids are off with different grandparents (Thane is with my folks, Grey is with Adam’s mom) for the April vacation week, and we are… on our own. I write great blog posts in my head while I run. The success rate of actually getting them down on paper is rather less than 100% though. During that run, I thought about how hard it is to know whether you’re doing a good job parenting. So much of who and how your kids are is up to them. That gets even more true the older they grow. I found myself wishing that we were as thoughtful and organized about setting goals and seeing if we were meeting them in parenting as we are in, say, work. What would my objectives for parenting look like right now? Long term? How would my performance be rated? One of my greatest objectives as a parent is to raise children who do not need me (but hopefully will still want me around). I want children fitted to earn their livings, of good integrity, with wide skills and self-sufficiency. I want to raise children who see clearly what it is that needs to be done, and have the insight, strength and knowledge to do it. Tragically, the way to accomplish this as a parent is not to “try harder” but to be wiser about what you say and do. I’m working on that. It made me feel hopeful, watching my sons courageously venture off alone, that a good start has been made. Lucky to be married to this handsome guy! There are many advantages to this April break scheme, but one of the excellent ones is that it gives Adam and I time to be together. You know, like a pair of people who married each other because they dig spending time together! Last night, we celebrated by going out to a “fancy fancy” restaurant – the Meritage in Boston. We got ready in a leisurely and unhurried way. We didn’t worry about what time to get home. It was crazy! This was food. It was delicious. Then we drove in to Boston to the Museum of Fine Arts to see the MC Escher exhibit and Phantasmorgia display. We read every word on every display piece in three different exhibits (we also checked out the revival jewelry exhibit). We LOVE going to museums together, but it’s a hard thing to do while contending with different attention spans. This lingering was a great pleasure. Almost as great as watching Adam eat a pickled grape, which was a study in expressions. We have similar plans for the rest of the week. Maybe some board games with friends. Checking out the new restaurant in town. Staying in Cambridge. Craziness! I am coming to think, though, that as nice as this is as a vacation I already miss my little boys and the energy and vibrance they bring to our lives. We are all the better for practicing our independence. But I’m so glad that there are years yet before they leave me. I miss my sons! I rarely repost old posts, but as we come up to Marathon weekend again, I can’t help but think of that day five years ago. Sometimes you may not guess who around you is a hero. Caitlin is to me, many times over. 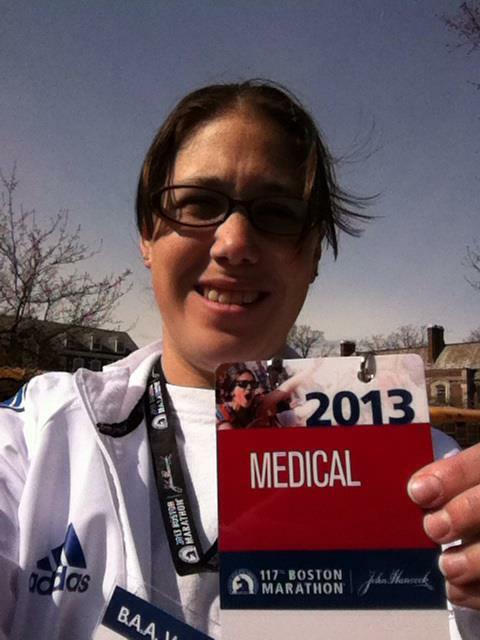 During Monday’s Marathon bombings, my friend Caitlin Rivet was working as a volunteer EMT at the Boston Marathon. I’ve known Caitlin since she was about 12. I taught her and her churchmates in Sunday School, youth group and confirmation. We’ve been close ever since, even as she moved into adulthood. At church this morning, Caitlin was there. Her face has a strip of abrasions from shattered glass from the explosion, and she shies away from talking about her Monday. It’s too close, and too hard to put in words. But she wrote this narrative about her day, and gave me permission to share it. When the marathon was just a fun sports event. This is it. This is the day when we’re feeling rested and relaxed. We’ve done most of the pressing chores that need doing. Quality time has been spent with loved ones, family and friends. Planning has been done for the coming year. Movies have been watched. And today, we were full of energy and verve and without commitments. So it was time to start a big messy project we won’t have time to finish. As I mentioned, we’re readying for the attic project in the new year. Part of that includes clearing the stuff that’s currently in the attic out. Our plan there is to move Grey’s bunk beds to Thane’s room with both twin mattresses. (Right now there’s only one mattress and the bottom is open.) Then the guest bed – a very nice queen bed – will move to Grey’s room. He’ll have to go to his brother’s room if we have company, but that’s the deal. This requires quite a bit of jigsaw-puzzle like furniture moving. Along the way, we painted a wall on Thane’s room that had been rather poorly maintained by the incumbent kid. I replaced the trashy looking particle board thing in the kitchen that always looked messy with papers spilling out with one Adam painted for me. And Grey used his brand new tool kit (a Christmas present) to help his father disassemble his bed. The day went fast! Now it’s a matter of energy – can we actually finish the tasks to a sufficiently completed state before we run out of energy? I’m a little sad to be going back to work tomorrow, but this has been a fantastic, restful and productive break. Also, very very cold. I gave the sermon in church this week, and it went pretty well I think! I definitely don’t have mental capacity to write two long form essays this weekend, so I’m giving you my sermon instead. For those who prefer watching and hearing to reading, this sermon is on Youtube. When I started my journey on the Pastor Nominating Committee, I looked to the book of Samuel for guidance. In Samuel, the Israelites are going through a crisis of leadership. It starts immediately. Eli, one of the Judges whose family has guided the national of Israel since Moses, has sons who are not living up to God’s expectations. That prophecy we remember a young Samuel giving, “Here I am, Lord, is it I?” That prophecy is to tell Eli that his sons will not succeed him. After giving this bad news to Eli (who takes it surprisingly well), Samuel grows up finds and anoints the first King of Israel, Saul. But Saul’s commitment to trusting God is shaky. Saul gets murderously jealous, clinging to power. And Samuel risks his life to trust God’s word and find a new King who will stick closer to God’s will. In the passage we read, Samuel goes through a long line of hopeful brothers – looking for Israel’s new King. Our search didn’t exactly go the way I expected, either. Rod retired on April 27 of 2014 – a week after Easter. Our interim arrived that summer, and we began the work of that interim period, figuring out who we were without our leader of 36 years. In Fall of 2015 we finished our intensive Mission Study work, using the New Beginning process. But as that year wound down, it became clear that Pastor Mike was not well. His last sermon in our pulpit was Christmas Eve of 2015. He was diagnosed the next week. By Lent of 2016, he was dead of the brain tumor that robbed us all of his guidance and presence. Those who were here at that point remember what a crazy, mad scramble it was. We had several weeks where we weren’t really sure who would be preaching, or what would happen next. My brother kindly filled in for us several weeks, and then Presbytery sent Trina to us. It took us a while to get our feet back under us, and resume our pastor-calling process. But by October of 2016, we were ready to start our search for our next pastor in earnest. They must be Presbyterian, because we are a uniquely Presbyterian Church. This is the common element we all share. We wanted a pastor who would be willing and able to be our pastor for at least 10 years. That’s actually a long time for a pastor in this day and age, but a third of the “average” pastorship in our church’s history. We understand there’s no guarantee that the pastor we hired WOULD be with us that long, but we at least wanted it as a possibility. There are three “big buckets” of skills for pastors: worship, pastoral care (of the sick and those who need God’s human touch) and administration (like fundraising or paperwork). Knowing that it’s very difficult to find all three, we focused on worship and pastoral care. For several months, the PNC met almost every Sunday after church. First, we wrote our MIF together. Then once it had been submitted, we read applications together. Each application from a pastor is between 6 – 10 pages long. And each of us needed to read all of them – we couldn’t delegate. We’d get a batch of about 30 and read them carefully and prayerfully. We took off their names and replace them with numbers, so we would be as unbiased as possible about gender or ethnic origin. We’d make notes on the candidates, and then come together to talk about who we wanted to invite to a conversation. All told, we read 131 applications. Once we had the list of candidates we wanted to talk to, we asked them to join us in a video call. We pretty quickly figured out that Monday nights were the best time for this. We’d do three half-hour interviews back to back to back – starting at 7 pm and often not finishing until 9:30 at night. (We always gave ourselves 15 minutes extra, in case they went long or the technology went wrong.) We called in from various homes and couches. We held interviews over 23 times this way. When we had a good short conversation with a candidate, we’d then move to a longer, hour-long video call. We’d briefly worship with the candidates, share our stories (we learned a lot about each other’s faith journeys and lives!) and listen carefully to what the candidates were seeking in their life and call. Three times, Spring, Summer and Fall, we then invited the best of the candidates to be with us in person. These were full weekend affairs. We’d start with lunch, to get to know each other. We’d interview them for an hour or two on Saturday, and then show them around the church. I’d drive them from Stoneham up to Lowell to show them just what it meant that we are a regional church. Then we’d have dinner at Brad’s house – the two of us who were session members – to answer any questions about church politics, history, finances or concerns they might have. The next morning, the whole PNC would get up bright and early to go to a strange church and listen to our candidate preach. We worshipped in unfamiliar pews, and listened to different music and tried to find the way to bathrooms in new churches. Finally, our candidate would meet with the Presbytery Committee on Ministry, who would then report back to us on whether they thought the candidate was acceptable or not. By the end of the second day, we were all past exhausted! Talking and thinking about our church so much, though, we ended up learning a lot about who we are and what makes us special. I wanted to pause for a few minutes to let you know what it is that is remarkable about our church – what impressed our candidates very much when we talked about Burlington Presbyterian. When learning how long we’d been without an installed pastor, the candidates would often ask about how restless the church was. “Are they giving you a hard time?” I’m sure that you have been restless sometimes in this journey. I know I have been. But not once did a single one of you ever give me a hard time, or the rough end of your tongue, for how long this was all taking. That is actually remarkable, and speaks to the kindness and patience with which we treat each other. Heck, the Deniers brought us cookies for every single meeting. These are not remarkable things in our church – it’s just the way we are. But it’s a precious thing about our congregation. There has been a lot of stress put on our congregation in the last four years. Our long long time pastor left. Our next pastor died suddenly. We have changed our music program. We have invited a new congregation to worship in our building. And the long waiting time. Many things have happened which were opportunities for discord and dissention. We had lots of chances to schism, or blow up at each other, or fall away. And we haven’t. Through it all, we have stayed together and loved each other. Even when we may not have agreed, or when there were very hard times, we have been on this journey together. Again, that is both rare and precious. Every single pastor we spoke to was amazed at our diversity. Our congregation comes from many countries in many continents. We speak many languages. We are not one culture, or two. We are a great feast of cultures. We don’t all share the exact same political viewpoints. Even here in Massachusetts, we come from many different communities, and from many very different backgrounds. Every time we worship together, it feels like a small Pentecost with our great richness of language and living. This is incredibly rare. Many churches are a lot more homogenous – the same – than we are. The ones who are diverse usually have TWO cultures. Not ten. The equality that we share in our church mirrors the equality we have before God in a wonderful and unusual way. We show up as who we really are, and we love each other the same way. We don’t pretend (much) to be perfect, or holier-than-thou. We don’t gossip (much) about each other, and when we do it is never unkind. We are a part of each other’s daily lives, not just on Sunday mornings but on Friday nights or Thursday mornings. Our kids show up to worship dirty from the soccer fields. Our babies cry during the sermon. The tags stick up on the back of our shirts, and our back-pew neighbor gently tucks it in. We are accepted and loved just the way we are. I hope it is the same for you, but when I come to worship I don’t feel like I’m faking it, or putting on an act. I feel like I am welcome here as myself. These things are remarkable and unusual – both in churches and in groups of people in general. These are things about our congregation that are worth treasuring, and preserving. Coming back to the book of 1 Samuel, the next King that God directed Samuel to anoint was one that hadn’t even been one of the candidates when Samuel begin his search. It required great waiting – remember that they did not even sit while they looked for David. David was out taking care of sheep – not really even eligible in the beginning of the process. It was an unexpected choice, driven by God’s will, and Samuel’s obedience to listening to God’s will. I feel the hand of God present in our search, too. It was actually a hard thing for me, to see our year of heavy labor end up with us exactly where we started. I wondered what the point was of having worked so hard and looked so long. This wasn’t how I imagined our journey would go. Our choice to call Trina was not one that we made easily, lightly, or without a tremendous amount of information. It turns out that Trina is phenomenal. In the time she’s been with us, we’ve both grown and changed. We’ve grown together. And together, I can clearly see us fulfilling the call to mission we spent so long discerning. A new phase in our life together beckons – filled with mission, outreach, music and new energy, but built on the authentic love that has preserved us so long. This project has been an all-consuming one for me this year. It’s not 100% done (see also the next steps) but I’m thrilled at the conclusion we’ve come to. It’s been a tremendous, and tiring, journey, and I’m glad to see home at the end of it!